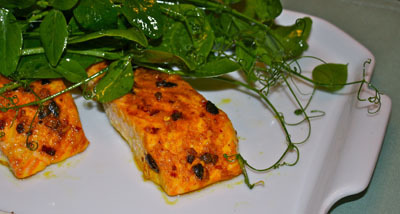 I picked up some gorgeous produce recently and was inspired to make one of my favorite dishes, curried salmon. In my bundle of fresh picked produce were pea shoots, which I think of as pea plants in their infancy. They taste like peas, but are more similar to spinach which means they make a wonderful salad. 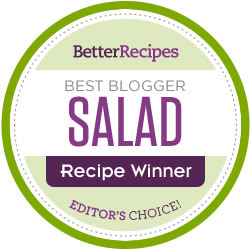 I would top my curried salmon with a fresh pea shoot salad! 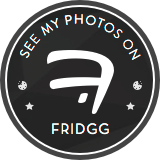 To see what I made with the other produce check out this recipe. I often use Spice Islands Calcutta Heat curry powder on chicken, turkey, veggies and fish. If you live on the West coast the name is just Spice Islands Hot Curry Powder. A well stocked pantry should always have a few different spice blends, such as a curry powder, an Asian blend, Cajun seasoning, Herbes de Provence, etc. The addition of a spice blend can make all the difference when cooking. Most supermarkets now carry a range of spice blends, as well as many Internet sources of spices. Some of my favorites are Vanns Spices, Penzeys, and The Spice House. I often make my own spice and herb blends, but a good quality blend saves you time. And time truly is money. To balance the heat of the curried salmon, I decided to make intensely citrus dressing for my sweet pea shoots. Hot + sour + sweet = delicious. In a small bowl mix the curry powder and olive oil. 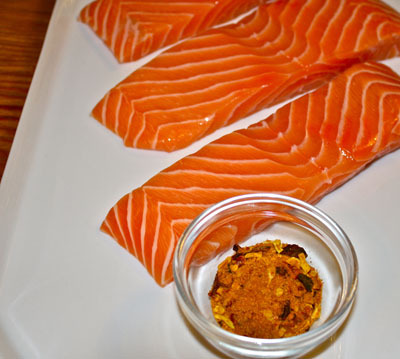 Rub the salmon with the curry paste. 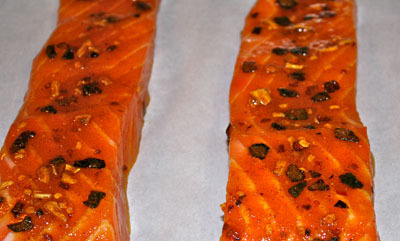 You can let it marinate for up to an hour or cook the salmon right away. When ready to cook, heat the oven to 400 degrees F. Place the salmon on a parchment or foil lined baking sheet for easier clean up. Bake the salmon for 12 minutes, or until just cooked through. While the fish is baking place the pea shoots into a medium bowl. If the stems are a bit tough, you can either use just the leaves or blanch the shoots in boiling water for 30 – 60 seconds. Immediately plunge the shoots into ice water to stop the cooking and refresh them. Be sure to dry them well. 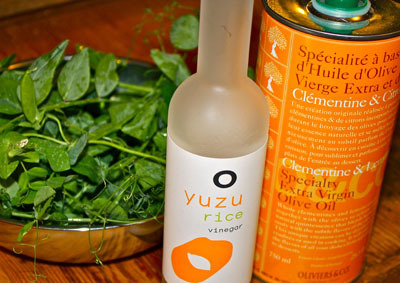 In a small bowl whisk together the vinegar, lemon olive oil, salt and pepper. 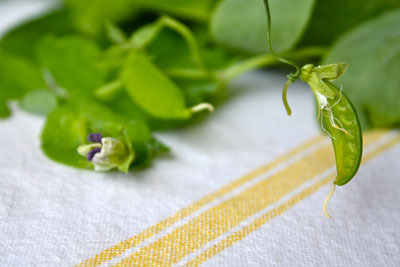 Toss the pea shoots and dressing right before serving. Place the cooked salmon on a platter, then top with the dressed pea shoots.